Can you tell I am already excited about the holidays? Plummy lipstick? Check. Silver eyes? Check. Pearl and gold jewelry? Double check. 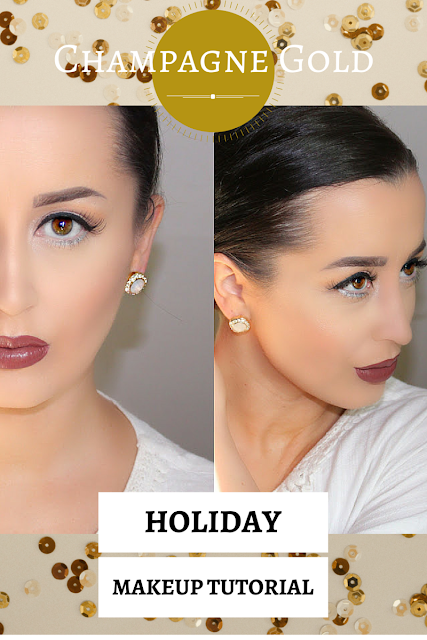 There is nothing I love more than looking festive, but this look can also be easily worn throughout the year. Prepare yourselves, there is more of this to come, plus a variety of extras! Expect a tutorial on how I cut my hair at home, trending product reviews, and more from my DIY Beauty series. 1. I moisturize my face with Clinique Dramatically Different Moisturizing Lotion and my under eye area with ELF Illuminating Eye Cream. 2. I prime my skin with NYX Angel Veil Skin Perfecting Primer and prime my under eye area with ELF Hydrating Under Eye Primer. 3. Using a Beauty Blender, I apply Kat Von D Lock-It Tattoo Foundation in Light 29 to my entire face. 4. To highlight and conceal I use Urban Decay Naked Skin Weightless Concealer Light Warm in a V-shape beneath my eyes, in the middle of my forehead, down the bridge of my nose, on my chin, and on my eye lids. 2. I also add a generous amount to my jaw directly below my contour line. 3. I allow the extra powder to sit on my skin for a few minutes to "bake" before brushing off with a Morphe Brushes G23 Soft Fan Brush. 1. 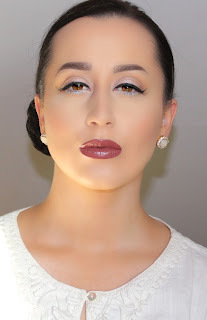 Using the Real Techniques Sculpting Brush I take the contour shade Sombre from the Kat Von D palette and contour beneath my cheekbones, underneath my jaw bone, along the hairline on my forehead, down my temples, and alone the parallel sides of the bridge of my nose. 2. After blending I apply the first color from the Morphe Brushes 9B Blush Palette, a soft orange-pink, using a BH Cosmetics blush brush. 2. 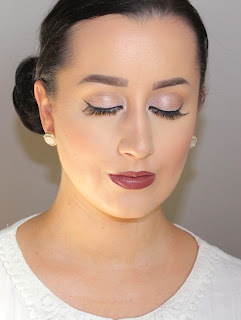 I fill in my brows with the Anastasia Beverly Hills Brow Powder Duo in Dark Brown. 3. I set my brow hairs into place with the Anastasia Beverly Hills Clear Brow Gel. 1. I take the color Peach Smoothie by Makeup Geek, a matte light peach beige, with a fluffy blending brush into the crease of my eye and start blending upward. This is going to be our transition shade. 2. I then apply the color Deep Skin by Morphe Brushes, a satin soft gold peach with pearl, directly into my crease with a small tapered blending brush using windshield wiper motions. 3. I reapply this color a couple times to build the color, making sure it blends into my transition shade but stays directly within the crease. 4. I first prep my eyelid with a small dab of ELF Glitter Glue. 5. Using a flat shadow brush I take the color Champagne from the Lorac Pro Palette, a white and pink shimmer, and press it onto the center of my eye lid. 6. Once the color is as vibrant as I want it to be, I then go back in with a blending brush and just make sure the crease is evenly blended and there are no harsh lines. 7. I then go back in to the Champagne and add just a touch more color to the center of my lid. 1. I take a small angled brush to draw on my eye liner using the Nyx Gel Liner in Jet Black. I get as close to the lash line as possible and press down on the lid to create a black line. 2. I wing out the black gel liner when I reach the outer corner of my eye. 3. I use the color Shimma Shimma by Makeup Geek, a shimmery pale beige, to highlight the inner tear duct with a fluffy blending brush, and a small flat shadow brush to highlight my brow bone just below my eyebrow. 4. I take the ColourPop Creme Gel in Kicker and glide it below my bottom lash line using a small eye defining brush, making sure to blend into the outer corner of my eye to give it a rounded out look. 1. I apply Urban Decay Perversion Mascara to my top and bottom lashes. 2. For my falsies I choose Ardell Curvy Black Lashes #410 and apply them using the Vegas Nay by Eylure London Lash Glue. 1. 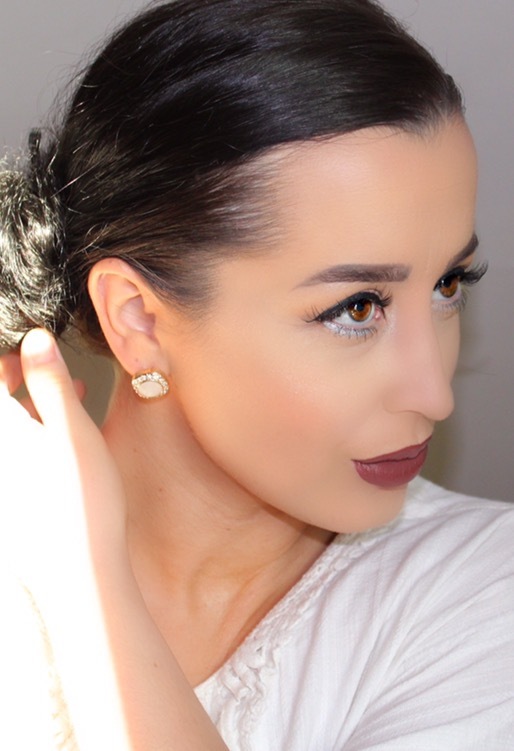 For my lips I both line and fill in my lips with ColourPop Ultra Matte Lip in Chilly Chill, a beautiful plummy brown. 2. I set the entire look with Mario Badescu Facial Spray. Do you plan on taking advantage of any cosmetics specials over the next couple months? Where do you purchase cosmetics from during the holidays?